The multi-use trail system is driving economic, environmental and cultural renewal — while saving the city millions of dollars. July 14, 2017 — Brilliant shades of purple, yellow and orange beckon hikers and bikers to maturing meadows in the urban center. Parents stroll children along trails cooled by the fragrant breezes of native magnolia, dogwood, oak and long leaf pine trees. Families picnic near a 40-foot cascading waterfall. Now, the Atlanta BeltLine is wiping out blight with 33 miles of multi-use trails along a historic rail line that encircles the city’s core. The ring of infrastructure is boosting environmental awareness in a metropolis that has been better known for suburban sprawl than parklands. Although other cities are turning abandoned tracks into greenways, the US$4.8 billion project connecting 45 neighborhoods offers unique lessons on urban renewal. 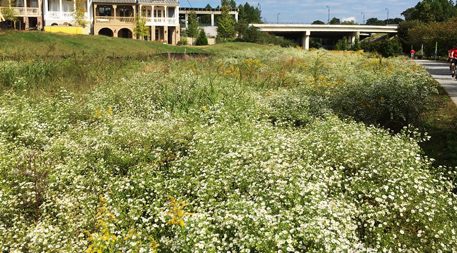 It was a master’s degree thesis that sparked the movement to build the BeltLine. In 1999, Ryan Gravel, then an architecture student at Georgia Tech, envisioned and fleshed out a plan to build a modern transit system to replace a ring of decaying rail tracks that encircled the capital city. Atlanta’s BeltLine is replacing urban blight with multi-use trails and greenery along 33 miles of former rail line. 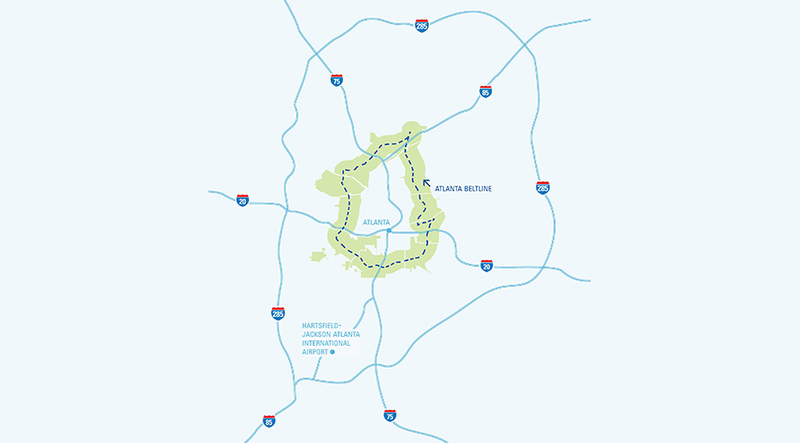 Map courtesy of Atlanta BeltLine, Inc. It took several years of negotiating among politicians, city officials, community advocates, real estate developers, landscape architects and environmentalists to solidify a proposal. Then, in 2006, Atlanta established the Atlanta BeltLine, Inc., known as ABI, to lead a renovation funded by private donors and the city that includes bike trails, parks, water management systems, housing, electric transit, art sculptures and more. According to Gravel, the project is the most extensive of its kind in the United States. This network-in-the-making is boosting environmental awareness in a city that used to be better known for its traffic jams and sewage-polluted streams. Efforts to clean up 1,100 acres (450 hectares) of contaminated brownfields and plant more than 3,000 indigenous trees and grasses are bringing back biodiversity not seen in decades. “I noticed for the first time in my backyard, we are seeing bees, butterflies, even fireflies, which is different than four years ago,” says Chad Ralston, who lives nearby and bikes almost daily. One major reason for the increase in biodiversity has been the native forest created under the supervision of Trees Atlanta, a non-profit organization dedicated to protecting Atlanta’s urban canopy. Trees Atlanta has planted 19 acres (8 hectares) of indigenous trees and grasses around the abandoned tracks. Ten more acres of reforestation are planned for next year. “It has been a challenge in what different parts of the community want and what we want,” says Greg Levine, the organization’s co-executive director and chief program officer. Local residents like the green space, Levine says, but often prefer it manicured. “They want more mowing, and then you don’t have the pollinator habitat,” Levine says. “They like the look of a meadow, but it takes three years.” Levine says Trees Atlanta and the city have reached an agreement to just mow along the edges of the path once a year, keeping the trails clear. Goats are also used to munch on the nonnative kudzu for environmental and economic benefits. As Head of Growth and Grassroots for ASW Distillery, Ralston helped convince his company to open a new location on a part of the BeltLine known as the Westside Trail. The real estate in the vicinity is booming and is the biggest economic driving force in the city, says Atlanta mayor Kasim Reed. Meanwhile, Atlanta is discovering that going green can save money. The city was planning to build a US$40 million concrete vault and tunnel system to store stormwater in the Fourth Ward. Every time it rained flooded sewers sent pollution into local streams, and the city had already paid the federal government more than US$19 million in fines for its cracked and broken sewer system. ABI stepped in to work with city officials to develop a better way to deal with storm water and sewage. The plan was to build a park bordering the Eastside Trail that recycles stormwater for a lake, fountain and waterfall. The ABI team saved the city at least US$15 million in stormwater infrastructure costs with its innovative design for the Historic Fourth Ward Park. The Atlanta BeltLine is trying to create more energy than it uses, too. An architectural solar canopy provides shade and sells electricity back to Georgia Power. Solar-powered trash compacter bins help save the city time, energy and money by wirelessly transmitting signals to garbage collectors when it’s time to empty the cans, instead of having trash picked up on a schedule even if the cans are not full. LED lampposts line pathways, saving electricity and minimizing light pollution. The city’s West Side is about to get a big boost because of the BeltLine. An abandoned quarry will soon add 300 acres (121 hectares) of green space adjacent to the Westside Trail. The new Westside Reservoir Park will be a source for 30 days of water, instead of Atlanta’s current three-day supply. Even though last year’s drought has ended, Atlantans still face watering restrictions because the city’s major reservoir is below full pool. Lawns can only be watered two days a week, and home car washes are forbidden. BeltLine designers turned a former bus repair facility along the route into a 6-acre urban farm. Photo courtesy of Atlanta BeltLine, Inc.
It’s changing diets, too. BeltLine designers transformed an old bus repair facility with underground fuel tanks into a 6-acre (2.4-hectare) urban farm. They cleaned up arsenic-stained soil and excavated buried garbage to revitalize the ground. 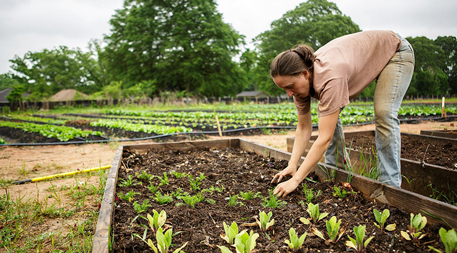 Now urban farmers produce an abundance of cucumbers, tomatoes, carrots and other vegetables that feed a neighborhood unaccustomed to fresh produce. The rest is sold at the nearby Ponce City Market, once an abandoned department store that has been revitalized into a thriving shopping and food court that serves as the commercial anchor of the BeltLine. 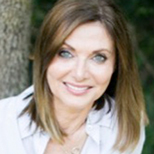 Editor’s note: Judith Moen produced this feature as a participant in the Ensia Mentor Program. Her mentor for the project was Nate Berg. UPDATE 07.17.17: Due to an editing error, the area of brownfields involved in cleanup has been updated. The correct area is 1,100 acres (450 hectares). So uplifting to read an article with positive news for Atlanta! An alternative to Detroit sprawl developed at the University of Michigan which lead to planning an developing a new community for 80,000 outside of Cincinnati. It fell through because of a financial crisis. It would have been an environmentally friendly community that was better for people. Terrific article, Judi! Let's get the Westside Beltline to move in tandem with the east side. Learned a great deal from this well written article. Thanks and congratulations Judy! Excellent update on the Beltline-very positive and insightful! Beautifully written and a wonderful achievement for Atlanta to spread the lasting beauty of nature for generations to come. Nice article Judi. I love to see the progress the belt line is making and generally making Atlanta a more bike-friendly town. I remember a bike ride I took 10-12 years ago. Upon my return, my wife informed me it was amongst the most dangerous bike rides in the country. Great progress for the city! Well written article on all the positive impacts of the Beltline. Good things are happening in ATL! 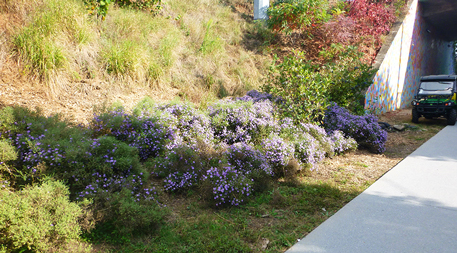 The Atlanta Beltline inspired us to plan the Valley Arboretum for the Fresno region. I spoken on the phone with Greg Levine and Peter Gravel and they were very helpful. Great read Judi. Very informative and I really didn't know how it all came together. We need more community projects like the ABI surrounding the city. I am doing research on similar "sustainability" plans and how they impact/influence gentrification. I understand there was blight in the area and now there are new homes, but the affordability for low- to middle-income is a concern. The "crowding" is relative but I wonder how long have those complaining actually lived in the area as well. This is a problem that is not being handled well in any region that is doing something similar. Beautifully written and inspiring article. I just love the story about how the vision and persistence of a few catalyzed the transition so much urban blight into healthy greenspace. Hopefully a lot more good things to come for our city of Atlanta. I have read a lot of articles and books about environmental issues in the last 20 years. Most of that reading has been very discouraging. This one is just the opposite. Atlanta's BeltLine is inspiring. The vision (from a GA Tech architecture student master's thesis) was developed with great planning, foresight, and cooperation. The synergy of the elements designed into this massive project is unfolding in profoundly positive ways. This article describes the impact of the BeltLine on people, businesses, and the city. It is fun to read about such a great idea that actually exceeds expectations! Great read and project on the Belt Line! Reading your article Judy gets me so excited about living here in Atlanta...I feel so positive about the direction our city is moving .